The name Balade En Provence, translated to “walk in Provence”, symbolizes the pleasure of walking in the fields of Provence, picking delicious fruits and flowers, while enjoying the peacefulness and natural beauty of the region. Now you can keep your hands silky soft and treat yourself to some French luxury thanks to this Pear Hand Cream. Enriched with 20% shea butter, this highly effective cream works to soothe dry and tired hands and leave them lightly scented with the delicate fragrance of pears. 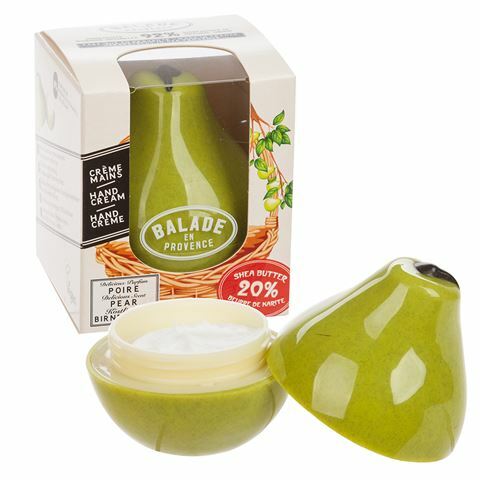 Presented in a small pear-shaped container, pamper yourself with this nourishing hand cream by Balade En Provence. Fragrance is developed in Grasse, France. Contains 20% shea butter to soothe, nourish and moisturize. To use, take a small quantity and gently massage it into both sides of your hands, between and along your fingers. Free from parabens, allergens and sulphates. Housed in an pear-shaped container. Beautifully presented in a Balade En Provence box.